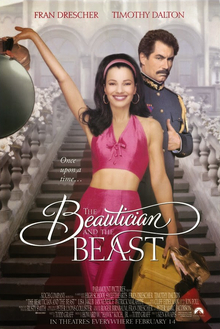 "The Beautician and the Beast" is an enjoyable and entertaining film, starring actress Fran Drescher as Joy Miller. Drescher, who is famous for playing the lead role on the television sitcom "The Nanny" plays a similar role in "The Beautician and the Beast." Joy, who is from New York, ends up in the fictional European country of Slovetzia as a teacher to the four children of a widowed dictator, Boris, played by Timothy Dalton. She ends up becoming more like a nanny and mother to them. This was a nice film. Drescher is a very likable actress who brings an effervescence to the roles she plays. Dalton was very convincing in his role, as he did a great job with the eastern European accent and delivered his lines beautifully.